Eating out is about more than just great food and wonderful service, it’s also about a warm and inviting atmosphere that allows diners to sit back, relax, and enjoy their dining experience. 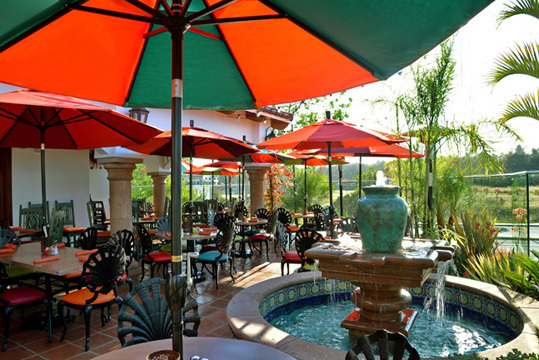 Unwind with us at Casa Sol y Mar on our beautiful outdoor patio! You’ll be surrounded by a lush garden, colorful umbrellas and a splashing water fountain made from Cantera Stone and handpainted tiles. While taking advantage of San Diego’s idyllic weather, you’ll dine near exotic tropical vegetation, experience the sights and smells of authentic and fresh Mexican cuisine, and get serenaded by our strolling mariachis. Guests also rave about our giant margaritas, and don’t forget happy hour, Mon.-Fri. from 4-7p.m. Hope to see you soon!